A proud, festive moment at the ribbon-cutting at The Banks at Berkley in Norfolk, VA.
FOR IMMEDIATE RELEASE, Westerville, OH, September 6, 2017…The Woda Group, Inc., held grand openings and ribbon- cuttings August 31, 2017, at two new affordable housing communities in the Hampton Roads area of Virginia. Events were hosted at Brennan Pointe, 3100 Warwick Blvd, Newport News; and The Banks at Berkley, 701 South Main Street, Norfolk. 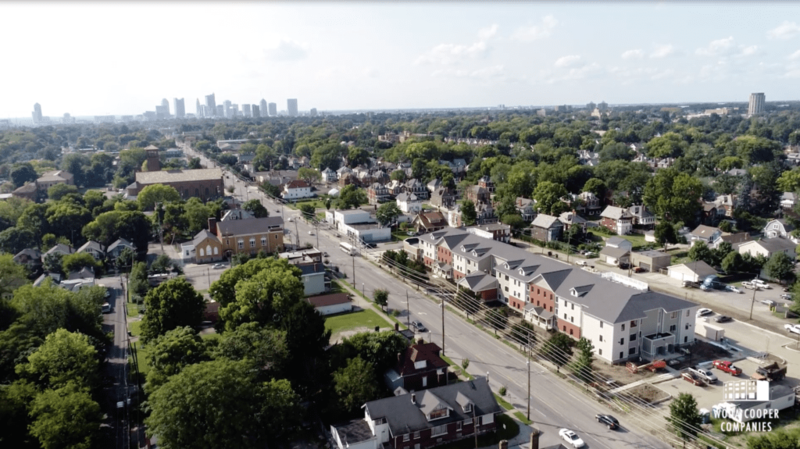 The events featured tours and remarks from community leaders and residents, government officials, experts in affordable housing, and representatives of the developer. A portrait of civil rights leaders and honoree Mr. George Banks was unveiled during the proceedings at The Banks of Berkley event where approximately 200 people attended. “Mr. Banks is an extraordinary person, a lifelong resident and champion of the Berkley neighborhood,” said Woda’s Craig Patterson, Senior Vice President, who led development at both locations and served as co-host at the events along with Bruce Watts, Woda’s Director of Development for Virginia and North Carolina. In introducing the honoree Mr. George Banks, Mr. Patterson described Mr. Banks’ efforts starting 50 years ago, “with a pocketful of nails, some hammers and a vision” to build affordable housing in the Berkley neighborhood. “We are thrilled to name The Banks at Berkley in his honor,” said Mr. Patterson. After a standing ovation, Mr. Banks thanked his family for support and spoke about the importance of volunteering to make lives better around you. “When you live in a community, and if you can give some time and effort, and you have know-how, then you should put that effort in your community,” urged Mr. Banks. Mrs. Pam Northam, wife of Virginia Lieutenant Governor Ralph Northam, discussed the importance of a “sense of belonging” brought through living in a community like The Banks at Berkley where “health and happiness” can flourish. After participating in a ribbon cutting ceremony, Mrs. Northam visited with local authorities and many of the residents in the apartment community, and toured the four-story building. Norfolk Redevelopment and Housing Authority (NRHA) chairwoman Ms. Barbara Hamm Lee noted the great need for housing in the Norfolk community. “With less than a 1% vacancy rate in Norfolk for properties affordable to renters at 60% or below AMI, the addition of quality, affordable and accountable multifamily housing and the convenience of a co-located primary medical facility is a homerun for the Berkley community,” said Ms. Lee. Two primary medical clinics – South Norfolk Medical Center and Dominion Physical Therapy & Associates — will open this fall on the ground level of The Banks at Berkley. Norfolk Councilwoman Angelia Williams Graves described The Banks at Berkley as, “an example of what a public-private partnership should look like. This is what we have – an a-plus product for an a-plus neighborhood,” she said. David Cooper, Jr., Principal for The Woda Group, Inc., noted the firm has sold only one of nearly 300 properties in its 27 years history of developing affordable communities. “When we make a commitment to a community we expect in 10, 15 or even 20 years, that it will look the same as it does today,” said Mr. Cooper. The Banks at Berkley is a mixed-use, 50-unit community that offers two- and three-bedroom apartments for seniors, families and singles who earn 60% of area median income or less. The Banks at Berkley was awarded EarthCraft Platinum certification due to its sustainable design and features. In addition to the modern, energy-efficient units, the development has a community room, covered parking, an outdoor picnic space, a playground and commercial space. Funding for the $9.3 million Norfolk development was supported by LIHTC allocated by VHDA, with U.S. Bancorp Development Corporation as the primary investor and Bank of America contributing additional funding. The 44-unit Brennan Pointe in Newport News is home to seniors, families and singles who earn 60% of area median income or less. In addition to the modern, energy-efficient two- and three- bedroom units, the development offers many lifestyle amenities such as a community room and outdoor play area. Brennan Pointe was also awarded EarthCraft Platinum certification. Funding for the $7.4 million Brennan Pointe development was also made available through LIHTC allocated by the VHDA, with RBC Capital Markets as the primary investor and Bank of America contributing additional funding. Construction for a second phase named Brennan Pointe II is now beginning. Karen Wilds, Newport News Redevelopment Housing Authority (NNRHA) Executive Director was a featured speaker at the Newport News event. “Projects like Brennan Pointe are critical to help meet the need for workforce housing in Newport News,” she said. “It is a quality project in our under-served downtown. It provides an opportunity for affordability to those employed by Huntington Ingalls Shipbuilding, the courts and other government entities in our downtown. Newport News Councilwoman and Vice Mayor Tina Vick gave a fantastic summary of why “safe, decent and affordable” housing is important for the people of her district and beyond. “In society, when things around us look better, inside we feel better and we do better,” she said. Mr. David Cooper, Jr.; Mr. Craig Patterson and Mr. Bruce Watts, The Woda Group, Inc. The Woda Group, Inc. and its affiliates are experienced developers, general contractors, and property managers specializing in the design, construction, and management of affordable multi-family apartments, senior communities, and single-family homes. Considered leading experts in the affordable housing industry, the Woda team is known for producing and maintaining high quality affordable housing. Affordable Housing Finance Magazine ranked The Woda Group, Inc. 9th overall among Affordable Housing Developers and 22nd overall among Affordable Housing Owners in its April/May 2017 issue. The Woda Group, Inc. has developed and currently manages over 275 communities and over 10,000 units.Woda Group, Inc. has offices in Westerville, Ohio; Annapolis, Maryland; Savannah, Georgia; Shelbyville, Kentucky; Norfolk, Virginia; Indianapolis, Indiana; and Mackinaw City, Michigan. For more information, call (614) 641-2301 or visit www.wodagroup.com. Or request from Karen Bernick, 563-320-2625.